April 1, 2010 - Starting to feel the stress of the April tax crunch? 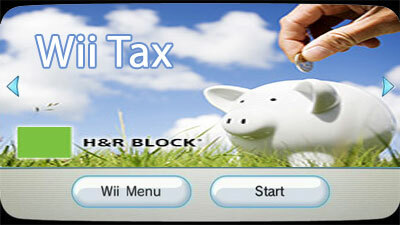 H&R Block jumps on the Wii bandwagon just in time to meet the annual tax deadline. The multi-billion-dollar tax preparer has announced a new partnership with Nintendo to offer free online evaluations and consultations via an exclusive channel for Wii. In what seems to be a push toward additional non-gaming-related features for the system, Nintendo revealed a new, free download that includes an H&R Block channel entitled WiiFile. Nintendo has stated that the channel will be available for download on the Wii Shop Channel from April 1-15. All Wii owners with Internet access will be able to send their tax information directly to H&R Block using an easy-to-navigate interface devised specifically for the console. "We're delighted to partner with one of the greatest software and gaming companies in the world to bring new and existing customers a practical and easy way to get their taxes completed for 2010." We're told H&R Block will also offer premium features, which include live counseling using the WiiSpeak room-microphone accessory. The company is dedicating a special team to handle tax preparations for Wii customers, and promises services that are comprehensive and precise. At a recent press event promoting the new WiiFile channel, Nintendo's very own mascot, Mario, chimed in to add, "I get'a my taxes done'a every year from'a da' H&R Block. They're'a great!" Yoshi was also there showing off new egg designs for the Easter holiday, but had no response when asked to comment on the new tax service. We're confident Nintendo's new partnership with H&R Block is just the beginning of things to come for Wii. Rumblings from other companies hint at a greater expansion of mass-market services for the console. Miyamoto himself has publicly discussed his own personal interest in online dating, so it might not be long before Wii owners finally have a reason to make regular use of the WiiSpeak accessory that came bundled with Animal Crossing: City Folk. Though Wii might not be shaping up to be the system some gamers had hoped for, Nintendo certainly is steering the console in interesting new directions. We encourage any and all Wii owners to give the new WiiFile channel a look. After all, only fools put their taxes off until the last moment.